The Funky Felter: The KCEtsy Trunk Show is coming soon . . . The KCEtsy Trunk Show is coming soon . . .
Mark your calendars for this Friday! Come and see what the talented local artists and crafters of Kansas City have to offer! 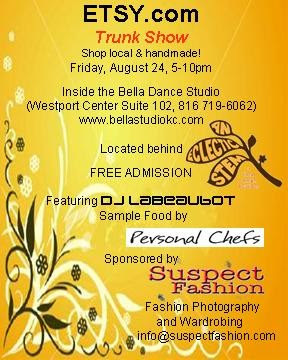 This event is Friday, August 24th, from 5 p.m. to 10 p.m. at Bella Dance Studio in Westport Center, Kansas City, Missouri. I'll be there selling my funky felted items. Several other Kansas City Street Team members will be selling their locally handmade goodies also. Come, browse, and meet the artists. Oh, and buy a few things too!